There are several steps you can take to help your computer run efficiently. Remember it isn’t always the computers fault. I always think about those times when there are so many things to do that you just want to crawl in to bed and hide under the duvet to escape! In effect, that is what your computer does when you keep clicking and asking it to do things. Have I too many windows open? Each one of those windows is making your processor think….if you are asked to do too many things at one time, you can get confused too! Have I too much stored on my desktop? Try to avoid saving items to your desk top. Proper file management should see you having folders under Documents on your PC. Name your folders and sub folders with sensible names, delete unwanted/unnecessary items. This will help make you and your PC more efficient. Are there items in my Recycle bin? The items you may have just deleted from your folders will go to your recycle bin. They sit here and still take up memory. If you don’t need these, delete them permanently. Have you archived your emails? Keep your email inbox tidy. Delete unwanted mail and use the Auto Archive function to archive old emails. Ensure you have protected yourself by installing the latest updates, patches, security updates. You can set your computer to do these automatically if you find that you are forgetting to do these. Ensure you have an up to date Antivirus package installed on your PC. This will help protect you when browsing online. Avoid clicking on suspicious emails or visiting untrusted websites. Like your files and folders, keep your programmes clean and remove anything you no longer need or use. Run Disk Cleanup! 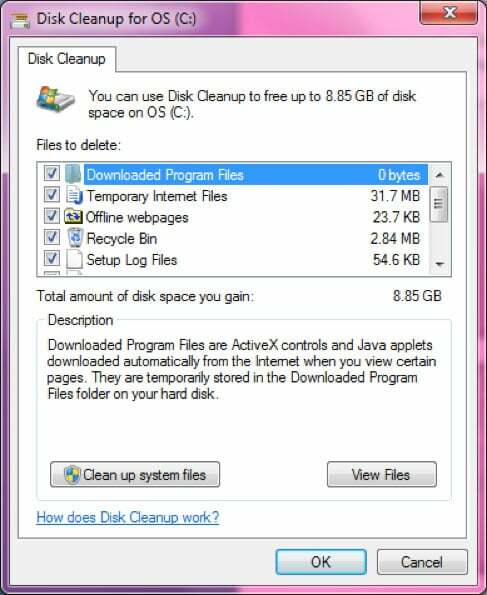 Run the disk cleanup utility by going to Start –> Programs –> Accessories–> System Tools about once a month. Click on the files you wish to delete, then click OK. You can see I am going to free up 8.85Gb of space. Rebooting your computer- If you leave your computer on all the time, you should shut down and restart your computer at least two or three times a week. This helps clear the memory and allow the computer to operate faster. Make sure there is nothing obstructing the fan on the base/ tower/ laptop. This can cause it to overheat. The fan can become dusty, this dust acts like a blanket, this stops it from working correctly, which also causes your computer to overheat and switch off.